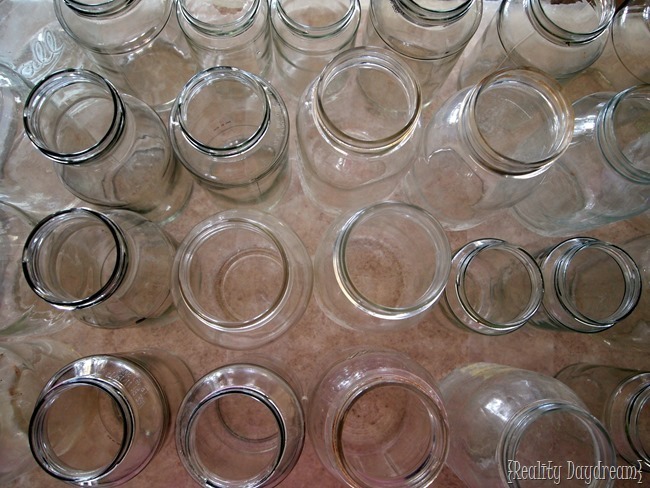 I started with a slew of clear mason jars (most of which I picked up at garage sales here and there)! I wasn’t sure exactly how many I would need for this project, so I threw in some spaghetti jars I had in the recycling bin. For this particular project, it doesn’t matter. They will just be a bunch of broken pieces! You’ll want to order some of this stuff. It’s called Vitrea 160 I only purchased the dye, but I would recommend getting the thinner as well. Even though it’s water-based dye, I think using water as a thinner may have contributed to some minor drippage. It wasn’t a huge deal, but just something I would try next time. Now here’s where I have some regrets. If you do this one simple thing (that I thought of too late) you’ll save yourself a MAJOR headache. 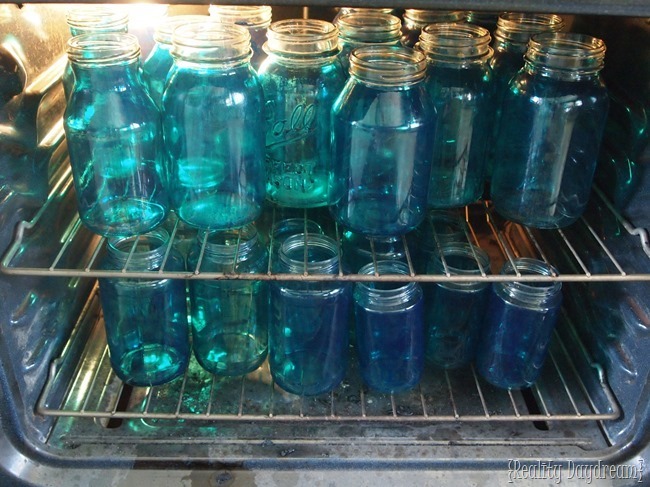 BRUSH THE DYE ONTO THE INSIDE OF THE JARS. I just assumed that the dye was permanent since you ‘bake’ it and since it claims to be dishwasher safe. But that is not the case. It will scrape off. 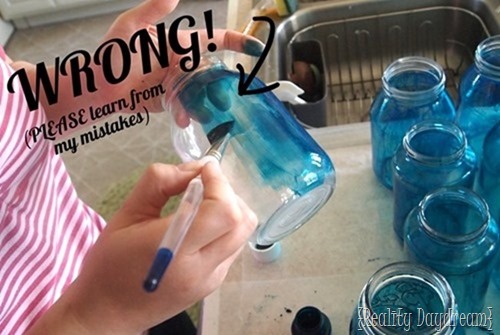 So DO NOT paint it on the outside of the jar. If I had done that simple thing differently, I would be MUCH happier with my project (you’ll see why in Part 2 of this tutorial). Please don’t let this fiasco inhibit you from trying this, because it could be really amazing. 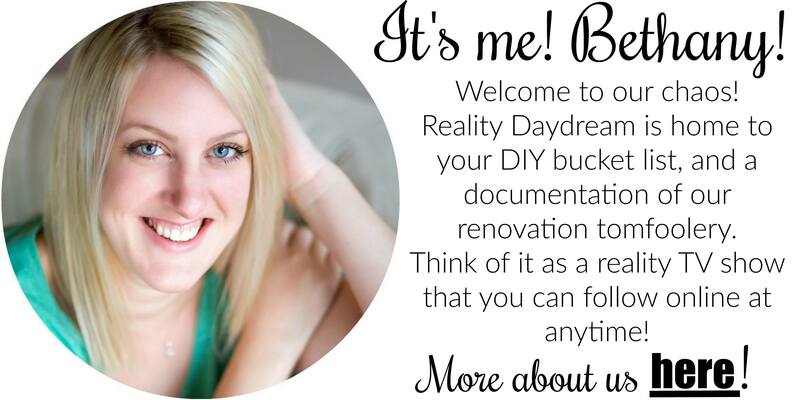 Part of being a DIY blogger is making mistakes so YOU don’t have to! Moving along! Pop those bad boys in the oven! (specific directions on the bottle)… I just let the jars cool in the oven overnight, because I didn’t want to mess with hot jars. 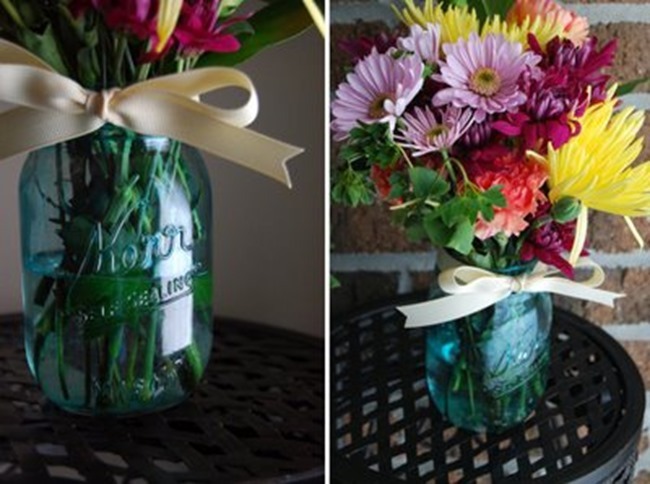 If you’re just dying your jars to use as decoration… you’re done! 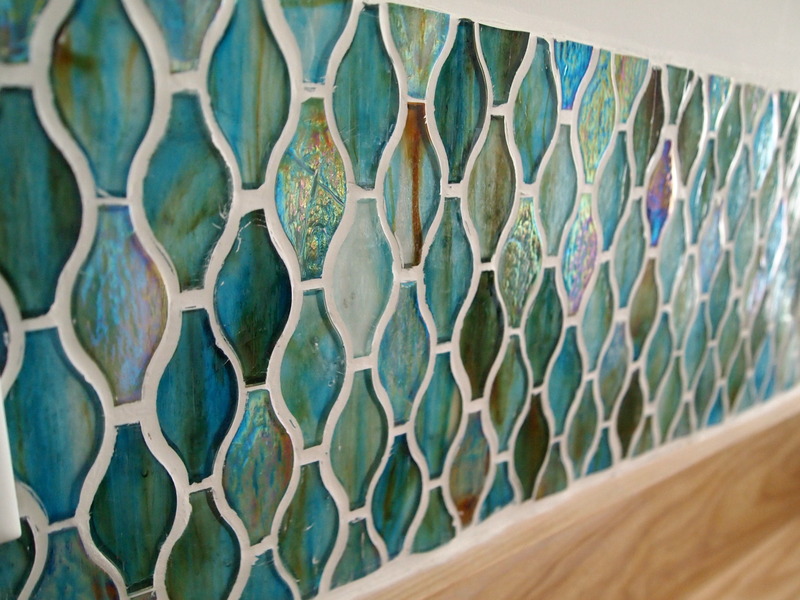 But if you’re going the long haul and want to make a killer mason jar mosaic backsplash… READ ON! I hauled them out to the driveway in a laundry basket, laid out an old sheet, and gathered my supplies: Hammer (baby monitor optional). 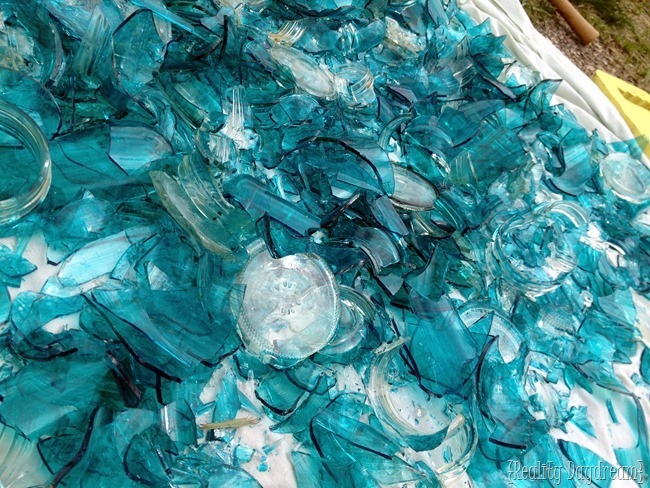 Then covered them with leftover bed sheet (to prevent glass from flying), and started popping them with a hammer! This part is FUN! Next, I put on some rubber gloves and started sorting. There will be some good size chunks that need another tap with the hammer. And there will be a lot of pieces you don’t want to use (like the bottoms of the jars and the neck). I had a laundry basket for castoffs, a 5-gallon bucket for the good pieces, and an extra jar to hold all the little shards that need to be disposed of. 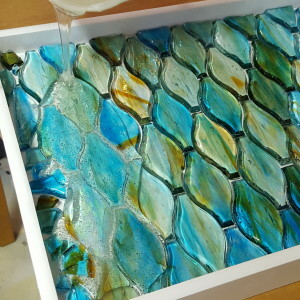 Did you know that when you’re making a mosaic, your pieces are called ‘Tesserae’? You can use broken china, shells, stones, beads… anything (even cut up credit cards! Not THAT’S a conversation piece). There’s your vocabulary lesson for the day. Check out my sweet Tesserae! CLICK HERE for Part 2 of this tutorial! 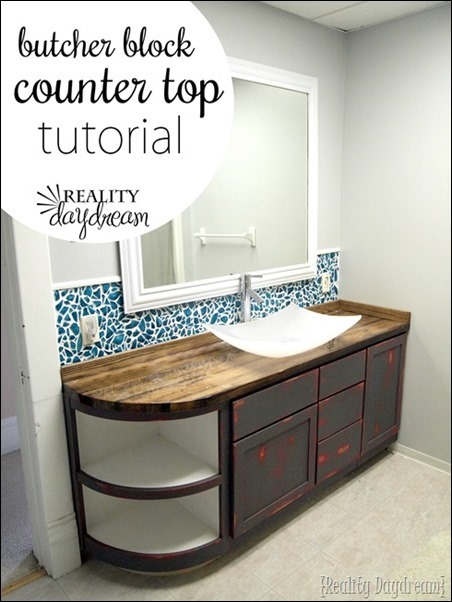 Be sure to check out our tutorial for the DIY Butcher Block Counters! WHY NOT USE GREEN COLORED BEER BOTTLES… OR SOME OTHER TYPE OF BOTTLE THAT IS ALREADY COLORED BLUE? Totally! You should do that! Please send me pics when you’re done! If you break the pieces anyhow, why does it later which side you paint? Just put the painted side face in. Perhaps that way the glass is to sharp because the curve of the glass? Also, I want to try this with wine bottles! My kitchen is wine themed. Thanks! I’m probably going to do the mosaic on drywall or plywood and then mount those pieces onto the wall. I’ll have to mark where the screws will go into the studs when creating the mosaic, and then after its attached, fill in the holes over the screws with a bit more mosaic and grout. Love this idea and would like to try it out. 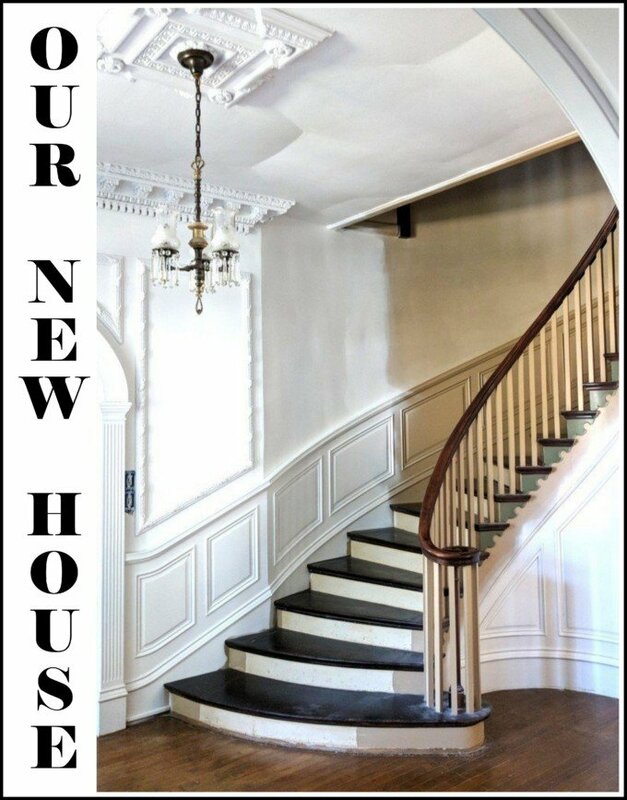 Am in the process of having a house built, but I bet I can save a lot by doing some things DIY. What did you do with the bottoms of the jars? I noticed you did not paint them. 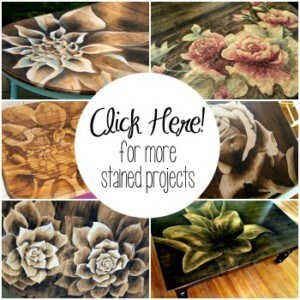 Did you up-cycle the bottoms for another project? Also, rather than painting the outside (or inside), if you had enough to slosh around inside the jar before baking and breaking, I wonder if that will save time and the headache (of finding out that the colour somewhat comes off)? By sloshing it around (or even putting the lid back on and shaking it until all or most of the inside of the jars are coloured with the tint), then it might be more time-saving and consuming (just a thought). I love your ideas and definitely would like to try it out (also the tray one). 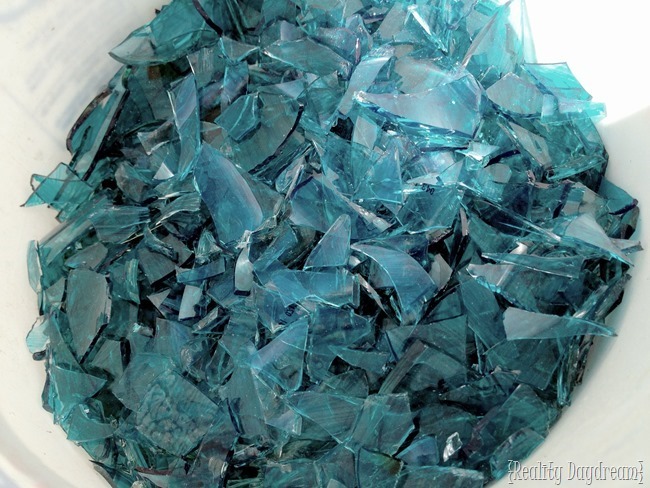 I have a lot of broken glass from my glassblowing class that I’ve already melted down so the edges are not sharp at all. I was hoping to find a project to use them for. . .now I have. Hi Raine! I didn’t end up repurposing the bottoms of the jars. I just pitched them. But I’m sure if I thought hard enough I could have come up with something. LOL! I do love your idea of sloshing the color around in the jar. But the glass dye comes in a TINY little container and I don’t think there would have been enough to use that strategy. But I do love the idea of it! Hey Raine! Nope I didn’t end up doing anything with the bottoms of the jars. But I’m sure I COULD have come up with something creative if I had thought really hard. LOL! I do like the idea of sloshing the dye around in the jar, but unfortunately those little jars of pigment are soooo tiny, I don’t think I would have had enough. They’re kinda pricey too. But that strategy would save a lot of time! maybe I missed it, but where did you get the dye? was there a link? Theresa we did a whole post on dying the jars. There’s a link to it at the beginning of this post. Hope this helps! There were a couple pieces of glass that stuck out a little further and had sharp edges, but we just took a metal file to them and filed it smooth. We LOVE our mason jar backsplash! It was so worth all the work! This looks great! I love the vibrant blue, it’s amazing! I’m trying to find this dye, and the link to it directs me to a RAINBOW of differ glass dye!! What was the specific color/ item number? Dani we used the color Turquoise! I agree, I loveeee the back splash and the counter top, but not so sure about the red/orange in the base cabinet with the aqua. AMAZING idea though with the backsplash!! How Amazing is this!!! Oh my I can’t get over how it combines my love for mason jars and awesome back-splashes! I would have never thought of this and it is so cheap! Thanks for the step by step and it turned out wonderful. I only wish I could talk my husband into doing something like this for our downstairs bathroom! LOVE the tile… don’t love it with the cabinet. I would have gone at least something closer in the brownish/blue family with that red to tie it into the wood countertops and tile. Personally if I had to choose what colour to paint it, I would have gone a crisp white with antiquing, but it is your bathroom so if you love it then that is all that matters! 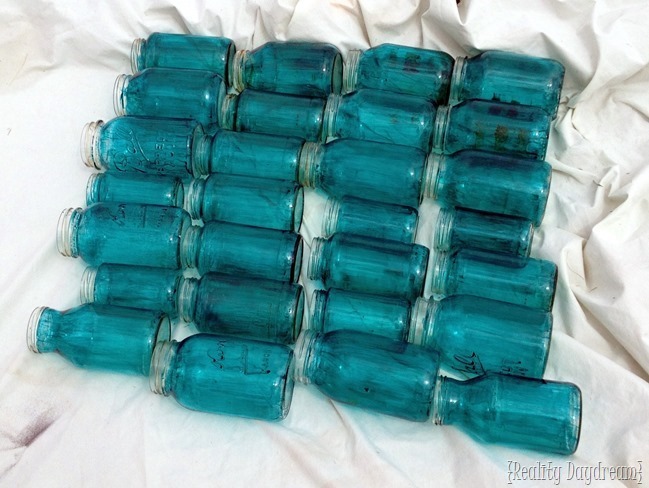 Absolutely beautiful, I love the blue, I’m going to buy that stuff and make my own blue jars. Thanks for sharing all your creative ideas for those of us who don’t have the imagination like you have. I know it can’t be easy keeping up with this blog when you have two little love bugs running around all the time. I love love love the tile. The whole thing feels so light and ocean inspired until you get down to the painted cabinet. Curious to see how you tie them together. Part of me is hoping you will change your mind and paint the cabinet a crisp white or deep ocean blue. You are so brilliantly creative!!! I would never in a million years think of doing this. This is purely beth-a-licious. I love it so hard! Looks absolutely fabulous. I just painted the window panes on my front door (9 lite) with a mixture of white glue and food coloring for a sea glass look. I love it so much I want to do more! A tumbler for the broken glass would be just the ticket. Thanks again for sharing your wonderful ideas. do you have a photo of the window panes you painted? 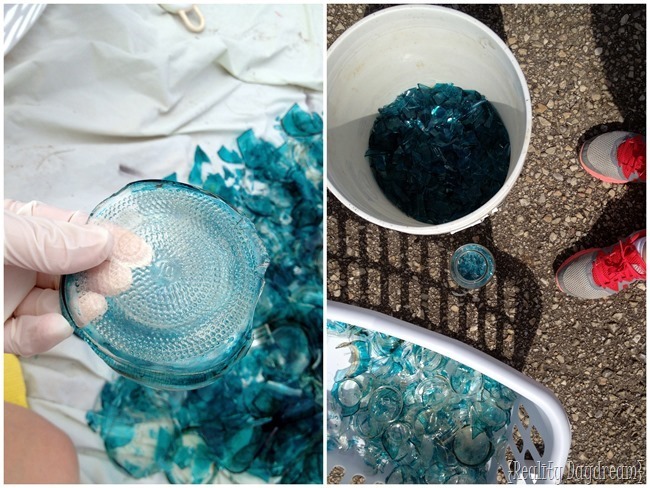 Sybil, we didn’t paint any window panes… just mason jars and spaghetti jars. But I think window panes would totally work. It would just be hard to know which side of the glass you painted after it’s broken because the glass wouldn’t have a curve to it like a jar does. I love your creativity…how you are not following trends but setting them! I just wish I could like the color of the cabinet more…the red/brown combo just feels garage mechanic to me. 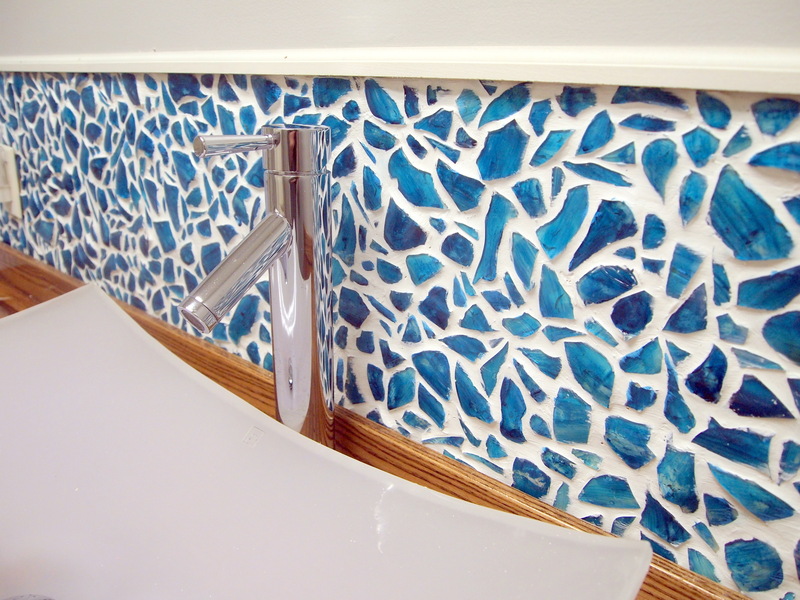 I would love it white and clean in my bathroom, especially with the blue mosaic. 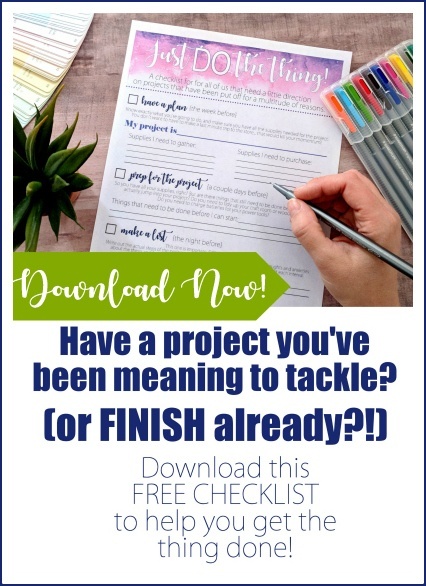 But, it’s your project – so love it! Should I tell you that you can buy the already broken glass? 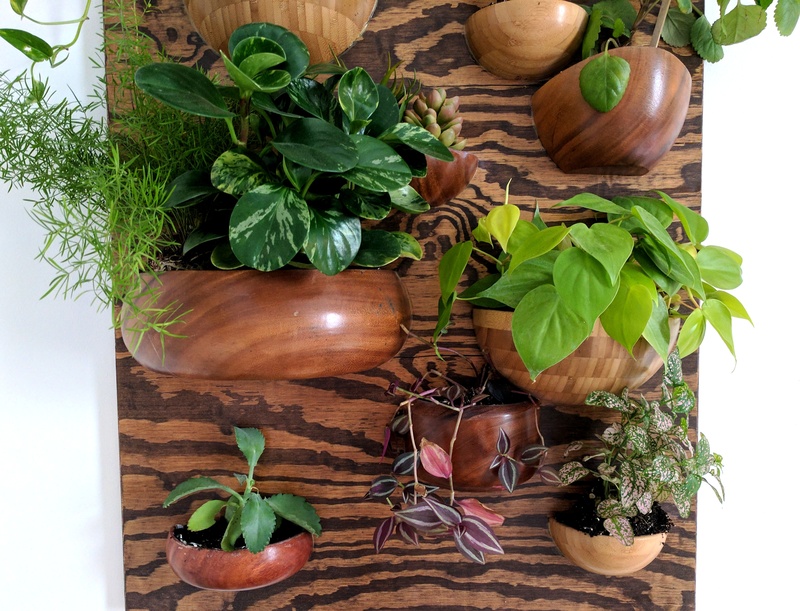 I bought tons of it from a nice lady on Etsy for my kitchen. That’s good to know! I probably still would have done it this way… because I like to do things myself instead of paying money. PLUS, breaking the glass was about the easiest part of this whole project. Installing it with tile adhesive and grouting is very labor intensive! HOLY AWESOME SAUCE BATMAN! I love it… what a tease not telling us the whole process yet 🙂 Can’t wait to read the rest! the back splash is the best part. It really stands out.